It was a warm, still night. We treasure these moments of complete silence. We imagine this may be one of the hardest parts of readjusting to city life – the constant noise. We had friends meeting us at Echo Summit that evening so we wanted an early start. We were packed and walking by 6:30 am. We high-fived before we left camp because we were proud of how efficient we were. 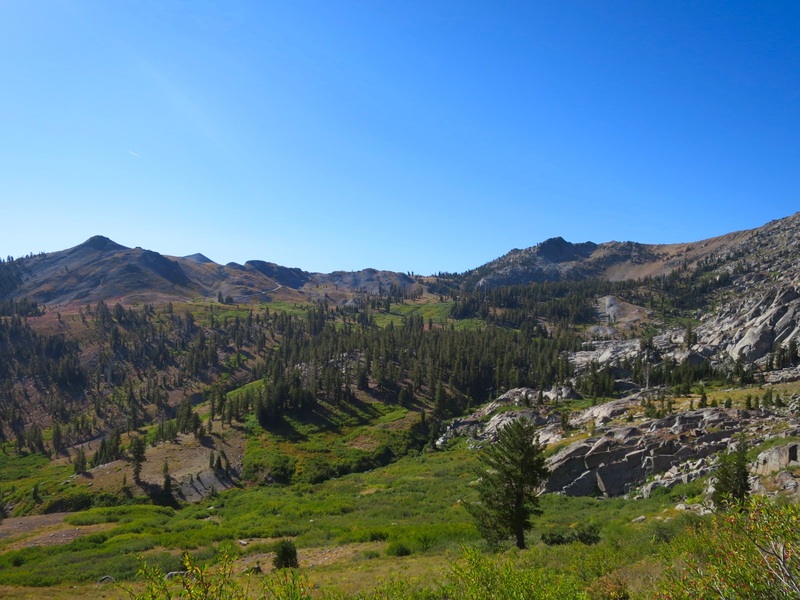 The air was warm as we hiked up a ridge above Upper and Lower Blue Lakes. Smells of bacon and pancakes wafted into the air from the campground below. Throughout this thru hike Andy has refined his hiker forensic skills. While normally staring at the clouds, he occasionally looks down and is great at identifying shoe prints. He then links these prints to those hiking around us which helps us know who is ahead or behind. This morning Laurie, who always stares at the ground, noticed recent animal prints. They looked like cat prints and were accompanied by deer prints. 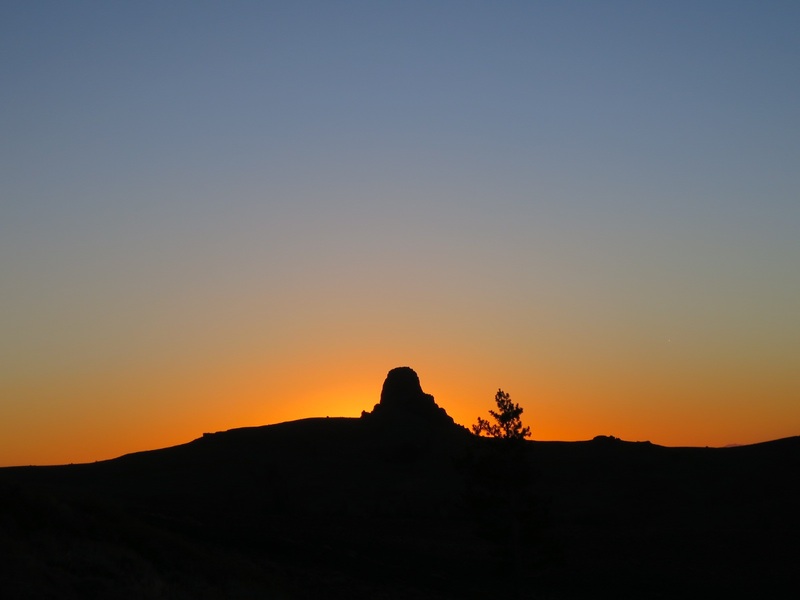 We created a story about the wild chase that had occurred at dawn. At one point in the quiet of the morning, the wind blew and rustled the dying mules ears leaves. Laurie jumped and squealed – thinking something was stalking her. We dropped down off the rocky ridge into a large green and yellow basin. The Aspen trees are starting to turn and the bright yellow leaves made us smile. We have walked through 3 seasons. 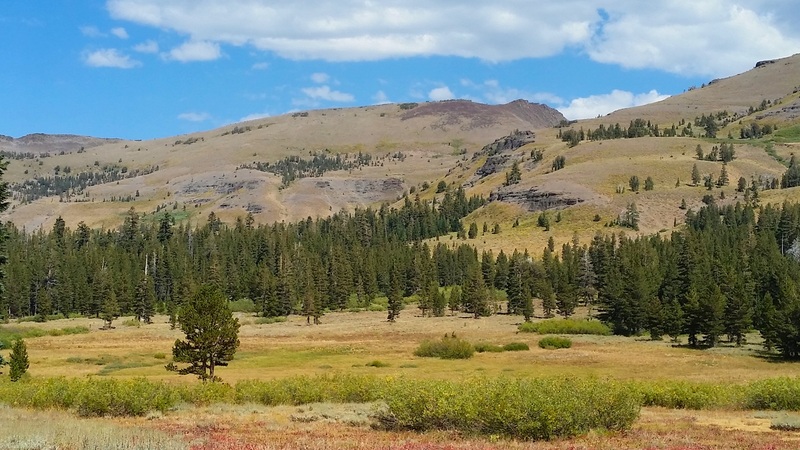 We switchbacked up toward Carson Pass, trying to guess where the trail would go next. 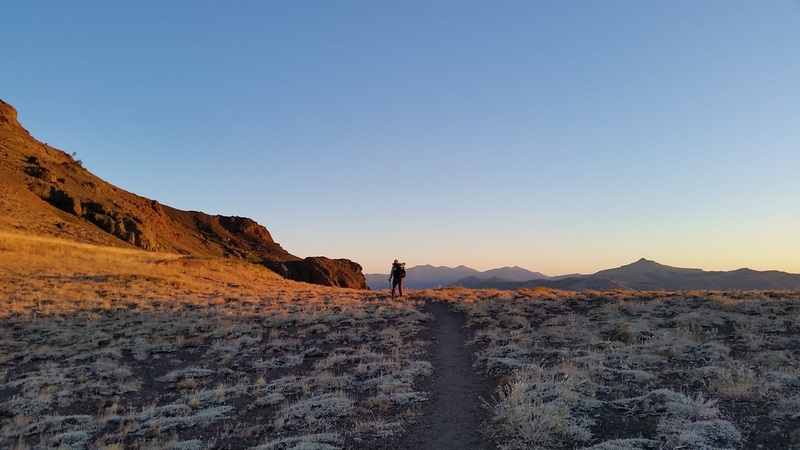 We stopped and chatted with 2 women at the junction of the PCT with the very popular Lake Winnemucca trail. 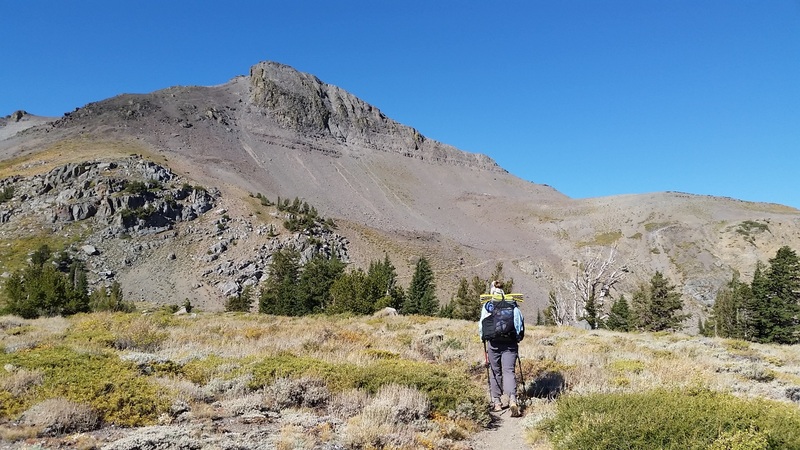 They had hiked from Sonora Pass to Carson Pass and were curious about our adventure. We chatted for at least 15 minutes before continuing on. We met again at the Carson Pass Visitor Center. This place was amazing. The log cabin is really cute, but what makes it amazing are the volunteers. 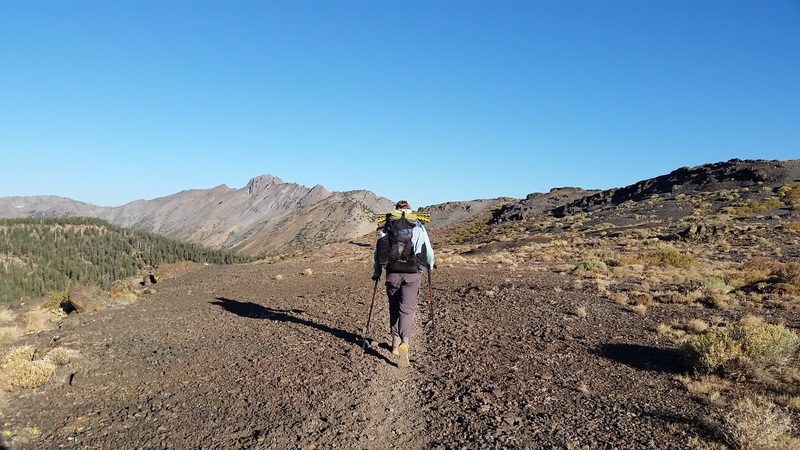 There are over 60 volunteers who take turns providing information to day hikers and offering shelter and a little R&R to thru hikers. They gave us potable water and shared parts of their lunch with us. So incredibly sweet! They had a scale and for the first time in over 6 months both of us weighed ourselves. Knowing that all scales are different and estimating our starting weights, we took these readings with a grain of salt. Andy gained 4 lbs and Laurie lost 10. How did that happen? Men typically lose more weight than women. Must be the amount and kind of foods we eat. One of the volunteers told us that we were the healthiest looking thru hikers they had seen! People also say we look clean… we guess our clothes hide the dirt well or they just don’t get close enough to us. We are pretty dirty! It was 13.5 miles from Carson Pass to Echo Summit. It was hard to leave the comforts of the shady chairs and good conversation but we didn’t want to be late. After an hour and a half, we unglued ourselves from our seats and walked into the afternoon heat. 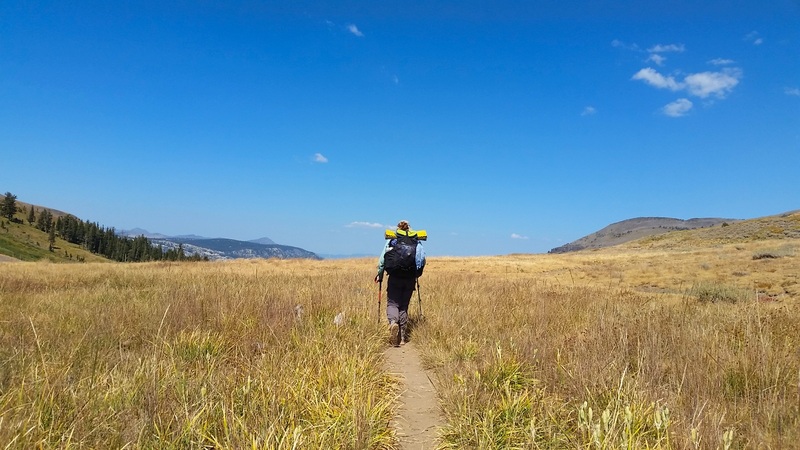 We gently climbed up to a ridge and then dropped down into a beautiful meadow with an old log cabin. 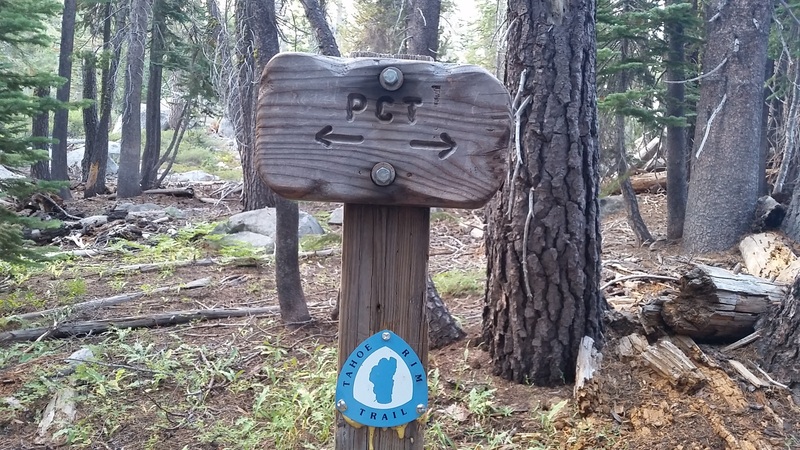 Here the PCT joined the Tahoe Rim Trail. 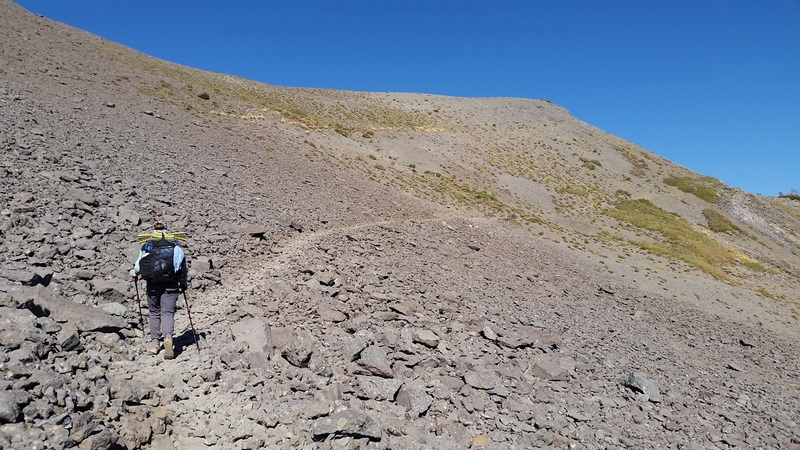 The trial continued on for 2 flat miles before climbing again to Showers Lake. We got water at its outlet and continued climbing. We were so excited to see friends and take a shower that the miles seemed to fly by. We got to the parking lot just after 6 pm. We changed into our “town clothes” and got comfy. Eric and Crissy had offered to pick up a “surprise dinner” for us too. We couldn’t say no to that! We had pre soaked Laurie’s mac and cheese noodles before discussing dinner options so we decided to eat a first dinner and then a second dinner with them. This is one of the perks of doing this much walking – indulging with no remorse. Crissy and Eric arrived right at 7:45 as planned, however we didn’t see them. We were sitting in a large empty parking lot but didn’t know that there was a closed gate up the road. It got darker and darker, and there we were, leaning up against our backpacks with our down jackets on, waiting. Andy’s gut told him to go closer to the highway but we didn’t move. Luckily Andy had service and got a text saying they couldn’t find us. AT&T didn’t work but Verizon did. At this point we got up and walked toward Highway 50. Eric was outside the car calling for us. Andy heard him and yelled back. As we turned the corner we saw the gate. Oops! Next time we will walk a little further! We were so happy to see great friends and ride in a warm car. We got to the house, ate a delicious Thai dinner (thank you Eric and Crissy for the wonderful surprise), took showers and did laundry. 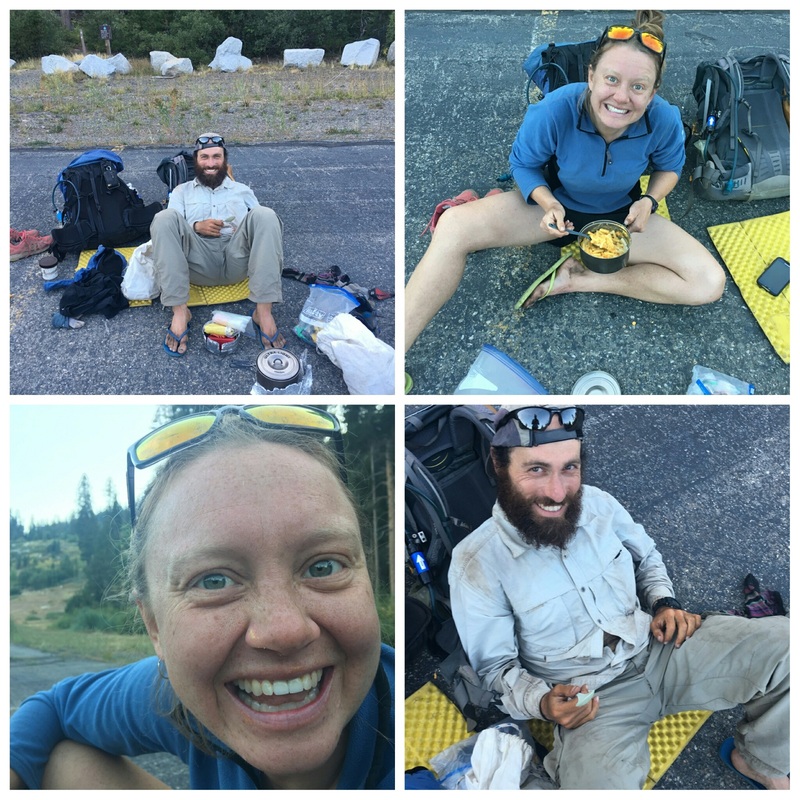 This was the longest stretch without a shower for us the entire hike – 12 days! We chatted until none of us could keep our eyes open. We go to bed tonight loving life, our friends and the delicious food we devoured. Tonight we are grateful for patient and generous friends, warm water and soap! Enjoying dinner #1. Can you see the cheese on Laurie’s nose? 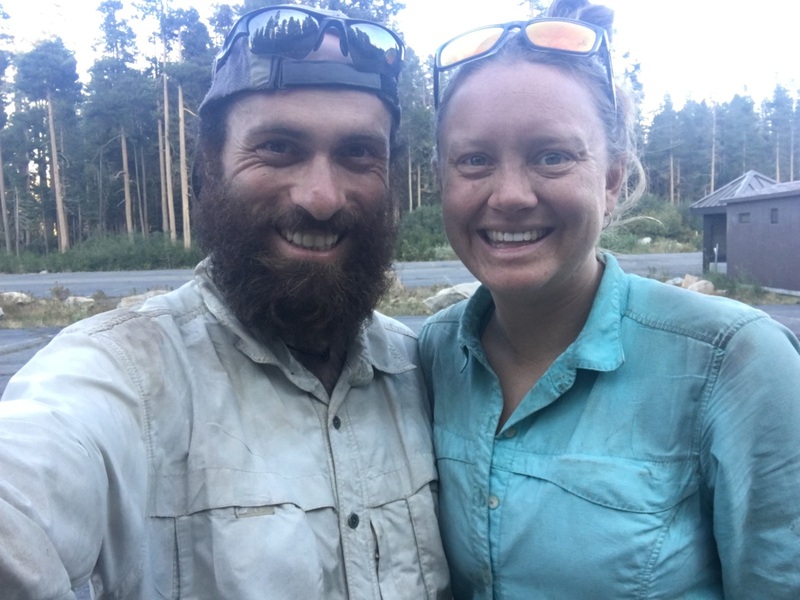 We might finally be dirty enough to be thru hikers!